Reading: Ask and answer questions about key details in a text. Phonics focus is Comparative endings -er, -est, and dge /j/. 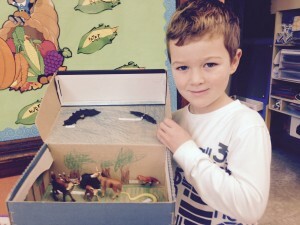 Retell stories, including key details, and demonstrate understanding of their central message or lesson. Know and apply grade-level phonics and word analysis skills in decoding words. Decode regularly spelled one-syllable words. Demonstrate command of the conventions of Standard English grammar and usage when writing or speaking. Use an apostrophe to form contractions and frequently occurring possessives. Math: Order events using real-life scenarios. Compare time. Tell time to the hour, half-hour, and elapsed time using analog and digital clocks. Read a calendar to find dates, learn the days of the week and months of the year. Science: We will be learning about the weather, seasonal changes, and animal behavior during these changes. Reading: Ask and answer questions about key details in a text. Phonics focus is r-controlled er, ir, ur, and contractions ‘s, ‘ve, ‘re. Distinguish between information provided by pictures or other illustrations and information provided by the words in the text. Know and apply grade-level phonics and word analysis skills in decoding words. Decode regularly spelled one-syllable words. Demonstrate command of the conventions of Standard English grammar and usage when writing or speaking. Use verbs to convey a sense of past, present, and future (Yesterday, I walked home. Today, I walk home. Tomorrow I will walk home). Math: Continuing from last week. Skip count by two’s, five’s, ten’s to 100. Identify 1 more, 1 less, 10 more, and 10 less than a given number. Find a pattern in odd and even numbers. Use patterns to solve problems. Science: We will be learning about the life cycle of a caterpillar. Math: Skip count by twos and fives to 100. Identify 1 more, 1 less, 10 more, and 10 less than a given number. Find a pattern in odd and even numbers. Use patterns to solve problems. Social Studies: Identify and name a variety of jobs workers do in their home, school, and community. Explain reasons why people may have to move. Math: Regroup objects into tens and ones and write the number. 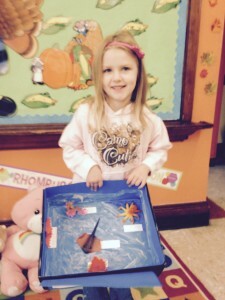 Model, read, and write numbers through 50. Read and write numbers through 99. Identify place value of numbers through 100. Show two-digit numbers in different ways. Social Studies: Define needs and identify that each individual has basic human needs. Define wants and identify that each individual has different wants. Describe ways people meet their needs and wants. Explain how people can trade to meet those needs and wants. Reading: We are reading Christmas stories. We will be working on our reading and grammar skills this week. Math: Count and write tens. Regroup 10 ones as 1 ten and write the number. Read and write numbers through 99. Identify the place value of numbers through 99. **Update for the Christmas Party. Thursday is our Christmas party. We will play a game to exchange gifts. Please send in a gift, boys buy for a boy and girls buy for a girl. If you would like to send in goodies for our party you may but are not obligated to. I will have some treats for them. Your child may bring a blanket and pajamas for the day. We will change into them after Mass. Thank you. Any questions please let me know. Homework this week is to spend time together as a family and help prepare for Christmas. Please continue to read with your child. Boys need to wear black pants and white shirts on Wednesday for the Program. Girls will have a white gown on that Mrs. Trout is providing. Our Christmas Party is Thursday! 2018-2019 The new year has begun and we are in full swing! We are starting our reading unit with the focus on short a words. 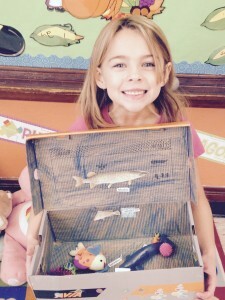 We are learning about animals and the rules in our classroom. It is going to be a great year! Easter is on it’s way. We made some really cute chicks in class. We are finishing our Science for the quarter and will be focusing on Social Studies. We are going to be learning money, time, and measurements over the next few weeks. We have 8 more stories we are going to be learning with over the last quarter of the school year. Hope you all have a wonderful Easter break and rest up for the final stretch of the school year. 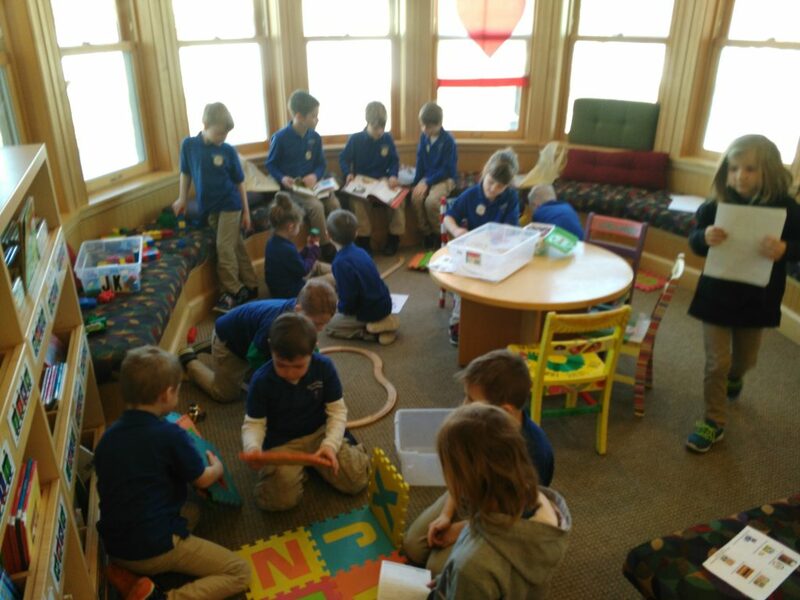 Students exploring the public library. The month of February is almost over and we have accomplished so much in our reading. This is the month to Read. We went to the public library to learn how to find books and some even checked one out. It was a great experience. We have challenged ourselves over the month to each read 25 books. We will find out how many books we read in all over the month of February. In school, we are reading AR books to see how many we can pass and get on the wall to complete our library of book spines. We are doing amazing with that. We are flying through addition and subtraction and will soon be doing measurements and geometry. Can you believe it, we are half way through the year! It has been a great year in first grade. We have been learning sight words, addition and subtraction, and reading books with lots of excitement. We have learned the long and short vowel sounds and how to decode words to determine which to use. Over the next few weeks we are going to be learning about compound words, plurals, r-controlled phonics, contractions, and comparative endings. We have Catholic School Week coming up with lots of exciting activities to along to celebrate, ending with the Carnival. We are going to be looking at timelines and life cycles this quarter. It is going to be a great third quarter! Enjoy the sun when it is out! The 2017-2018 School year has begun and we are having a great time. We have begun to read many stories. We are halfway through our first quarter already. 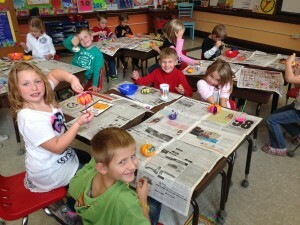 In October, we are making apple pies and doing our community service projects. We picked up the football field the day after Night Under the Lights. 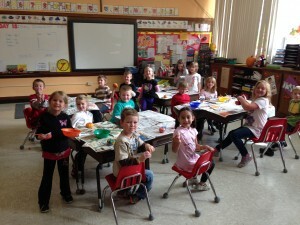 The First and second graders had fun. They filled many bags with trash. We are going to clean up a park as part of the Work-A-Thon for the whole school project. We are also having a Volunteer Appreciation dinner for all those who take time out of their lives to help us make our school a success. Thanks for all you do! Enjoy the fall colors as the leaves change! The end of the year has come. 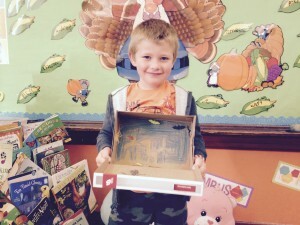 We have made great success in the first grade! All have doubled the goal of AR points! Way to Go Kids. You ROCK! Enjoy your summer and I will see everyone next year! This month we will be measuring different objects to learn how to read inches and centimeters. We will be working at improving our addition and subtraction skills. We will be striving in our reading and writing as the year winds down. We are excited for the last couple of months to really see how much we have learned in First Grade. Have a great month everyone! This month flew by. We learned to tell time, count money, and we finished the month out with over 130 A.R. points for third quarter! 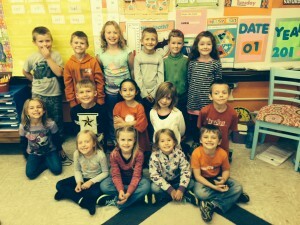 Way to go First Graders! We have a new challenge for reading. If all First Graders earn 10 or more A.R. 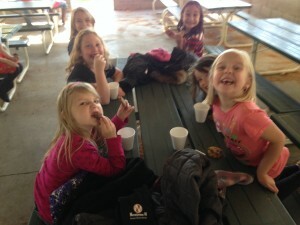 points, they will get a day in their pajamas, watching a movie while eating popcorn and then go outside for an extra recess with root beer floats to cool them off in the near summer weather. It has been a great month! We have worked at completing our Reading challenge for I love to Read month. We talked about Groundhog’s Day and learned that we have six more weeks of winter. We celebrated Valentine’s Day with math activities. The 100th Day of School on February 20 was a blast! 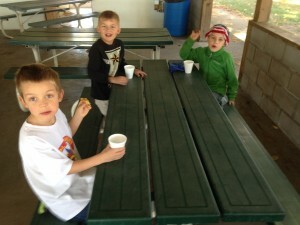 We counted up to 100, down from 100 and did several other activities that consisted of 100. We are moving into March with learning about place value, greater than/less than, and figuring out what numbers are even and which are odd. We have been working hard on our handwriting while making sentences. We are reading a variety of books with different genre’s and finding out what the author is telling us. We are able to spell lots of words. We are having a great time and can not wait for spring to come! We have been busy in First Grade! We are learning the letter y vowel sounds in reading. We are learning Geometry for math. We are working on identifying shapes and what shapes can be put together to make new shapes. We are learning about working in a community in Social Studies. 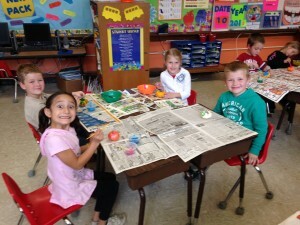 In Science, we are learning about life cycles; how an egg turns into a bird, a seed into a flower. We are working on making decorations for the Carnival this year. We are learning about the Holy Trinity in Religion. It has been busy since we got back from Christmas break. We will continue to work on different activities to build our skills in the areas of reading and math. We play rounds of lightening using math flash cards for addition. 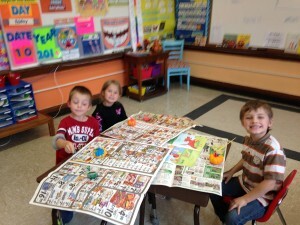 We love to play I have…Who has… sight word games. 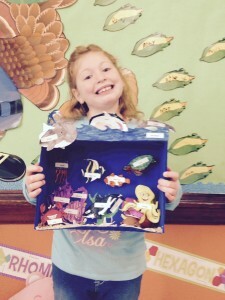 Life is always exciting in First Grade! Enjoy the snow and stay warm! In reading we are learning about words with short e vowel sound. We are continuing to learning about characters and settings in a story. We are also learning to pick out the main idea of the story this week. We are going to be looking at how stories are structured this week along with different genres. We have started learning the parts of sentences. The naming part includes the noun and the action part includes the verb. In social studies we are learning about what it means to be a citizen. We will be discussing Fire Prevention and going to visit the fire hall. In science we are learning about animals wild and tame. What their needs are and where they live. 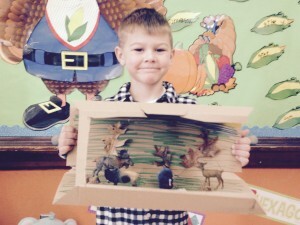 We will be looking at a variety of animals and learning about their habitats. In math we are learning about subtraction concepts from 8 to 0. Learning how to structure number sentences horizontally and vertically. We are going to be receiving a fruit or vegetable snack through a grant on Tuesday’s through Friday’s. There will not be snack on Monday’s so if you would like to send a snack from home on this day, I know your child would love to eat it during our morning snack break time! We only have 58 days of school left. In reading, we are in our fourth unit and we have seventeen spelling words each week. This week’s words are T. Rex, found, mouth, once, wild, king, boat, road, snow, row, yellow, loaf, coat, soap, blow, and pillow. We just finished I love to read month, and each child received a free book from the book swap. We placed second in the door decorating contest! Good jobs first graders!In math, we are adding and subtracting with fact families up to the number 12. 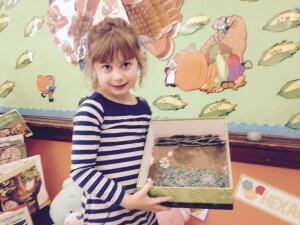 In science, we are going to start learning about rocks and minerals. 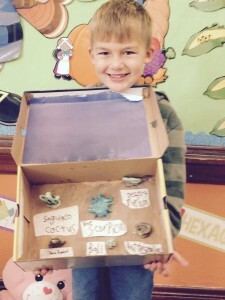 In social studies we are learning about community resources, such as museums where you can find dinosaur bones. In religion, we are learning the importance of prayer and really working on our prayers and looking forward to the day we do our first mass in church. Enjoy the wonderful weather God has given us this week! We just wrapped up 1st quarter today! It’s hard to believe that we have been in school for 40 days already. Our Halloween party was a blast. 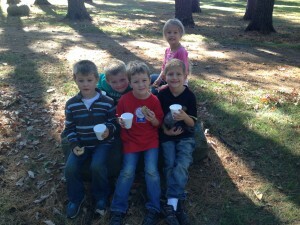 We had lots of activities that we did that day and LOTS of candy was shared. The First Graders are challenging themselves everyday, reading harder books and learning new math concepts. They even challenge me. I am so proud of all of them! They asked me about volcanoes and so we sidetracked for about a half hour this week to learn a little more about them and then we did an experiment so see first hand an “eruption”. It was pretty cool! In math we have been learning adding, subtracting, and graphing data using a bar graph and tally marks. It has been fun having them show me how they would gather data. In Social Studies, we have been learning about the past, present and future. We have also been learning about citizenship, community and the hero’s we have, and what lists can be used for. Thank you for all the support you have given me thus far. I really appreciate all the work you do with your children at home. It really shows in the classroom. Good luck to all the hunters this weekend! This week is Catholic Schools Week. The whole school has been extremely busy getting everything done for this week. Monday the whole school participated in the game “Minute to Win It,” each grade played a different game against each other. The students and staff had a blast in watching and participating in the games! It was so fun seeing all the Superhero costumes on Monday as well, since it was dress as a superhero. There were many different 1st grade Superheroes that day! 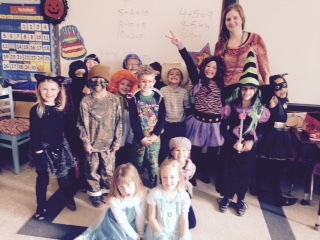 Tuesday students and staff wore camouflage for Camouflage Day. Along with Camouflage day we participated in Stop, Drop, and Pray which every student was able to say who or what they would like to pray for. 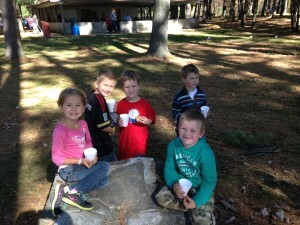 In the afternoon, students got an extra recess followed by hot chocolate. Wednesday was Pajama Day and No Homework Day! Kickoff to the Dance was also on Wednesday followed by the Community Pajama Dance Wednesday night. Everyone was very excited for the dance! For Thursday, it will be Sunglass Day along with Classroom Feud. Students and staff will be facing off to play a version of the favorite Family Feud. What a blast it was to finally see the Christmas Program! The first graders did such a good job being Baby Dolls and Toy Soldiers in the Christmas Program! It’s hard to believe all the practicing they did before the program. I am so impressed in how well the all students did! This week has not been normal by any means. However, between the program practices and everything else we have had a chance to learn. In math, we are learning how to identify ½, 1/3, ¼ parts, along with reviewing shapes and addition problems. We are also working on Xtramath in the classroom which all students seem to be enjoying. In reading, we have been working on spelling words with vowel sounding y words. First graders have been writing about what they are giving to their families for Christmas. Along with working on being able to write steps in writing. They all wrote about how each would catch a gingerbread which was very entertaining to read. It’s hard to believe that Thanksgiving is already next week! In first grade we are learning about plane and solid shapes in math. 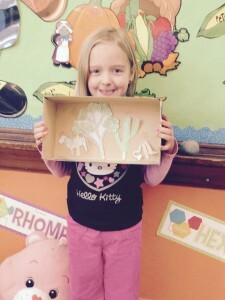 First graders are learning how to identify, describe, and compare the solid and plane shapes. We are also working on identifying the faces on solid shapes. For reading we are working on Long u and Long e and how the words change when the e is added to the word. Along with adding –ed to words and changing the end sound of the word. Our last few weekly stories have been about animals which all the students having been enjoying to read. 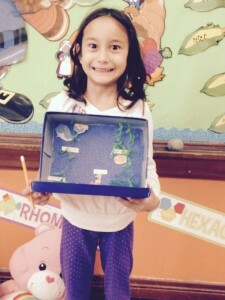 First graders having been learning about the seven continents by making each individual globe plate craft. Turkeys also have been made to show what each student is thankful. Each feather represents one thing students are thankful for! Quarter 2 has started! 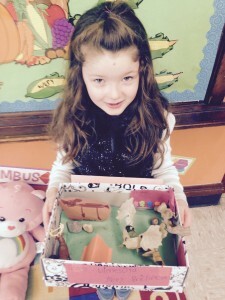 All students did great with their habitat projects. It’s amazing all the different ways that each habitat was created! 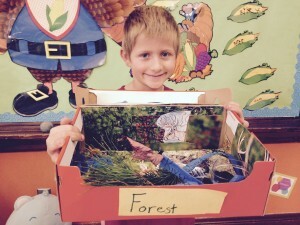 Check out the pictures below to see the different habitats the students created. 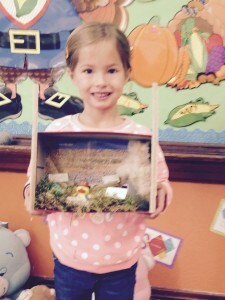 The first graders were also able to show off their habitat projects with the other classes coming in and looking at them. They were all super excited to show them off! We also have been practicing Veteran Day Poems with the second graders for the Veterans Day Program. The Veteran’s Day Program is on the Veteran’s Day and all our welcome to come. Students each made their own Heart American Flag and Poppy which all look great! Thank you parents for coming to Conferences! I hope I was able to answer all your concerns or questions, if not as always let me know. Remember all students need snow pants, boots, hats, coats, and gloves/mittens. We just finish taking the Reading and Math NWEA tests this week. The students all did excellent and parents should be very proud of your child and/or children. Your children are working very hard each day and all seem to be enjoying school. It’s hard to believe it’s the end of September. Students and teacher are settling into a good routine. We have been reading many stories together, in small groups, with partners, and by ourselves, which is working on our improving our reading skills. In math we have start Unit 2, and I am proud to say that all students did wonderful on their first Unit 1 test. For church and religion, we have been working on kneeling, praying, and the sign of the cross. First Grade is off to a wonderful start!